It’s about time they spoke up about this. Also we’re proud to be setting the record straight with a re-publication in October of David Corbin’s edited collection, Gun Thugs, Rednecks, and Radicals: A Documentary History of the West Virginia Mine Wars (https://secure.pmpress.org/index.php?l=product_detail&p=364). Of the $17 million spent on the Museum, too bad not enough was spent to get the precious and hard-won contribution of the UMWA to WV, Appalachia, and the rest of the nation accurate. This reminds me of the sculpture just outside the center, one quarter of which, pays homage to Mountain Top Removal–a practice that divides us spiritually, economically, and morally. Not only is history being rewritten and distorted inside the Museum, but so is reality outside of it. This is another of many instances where oil and coal corporations have had the luxury of writing their own histories. Congratulations to the UMWA and West Virginia’s professional historians for challenging these Orwellian absurdities. 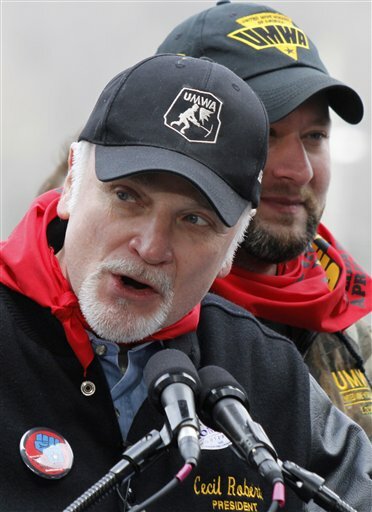 Good on the UMWA for critquing the coal industry’s “immaculate conception”. Perhaps, we Americans don’t like to recall the inhumanity that we have practiced on our own soil to our neighbors, but it does no good to pretend it did not happen. WV has been treated as a colony throughout its existence, its people as subjects to a crown, rather than as free citizens. For those in WV who have fought for the rights promised in the Constitution, those coal miners and their wives and children who fortified themselves to repel the oppression and starvation plagued upon them regardless of cost, may the UMWA fight on. If fights not just for the real history of WV, but of the story of labor everywhere. This sounds a lot like the rewriting of textbooks here in Texas. You’d never know there was ever a labor fight waged here. Or better, like Stalin’s attempt to rewrite the history of Russia and we all know how well that went….. It appears the W.Va. Culture and History Commissioner Randall Reid-Smith prefers the story about the relationships between coal miners and coal companies during the last century to be “sanitized” in order to be politically correct in this State. Absent from the WV Culture and History’s version is some important details about the coal company towns or coal camps. In these coal camps, the coal operators owned and controlled everything from the houses, schools, churches, doctors, and even the stores where miners purchased their everyday needs. The coal companies even issued their own currency called “scrip”, which was only redeemable at the coal company store. Whereas, the coal miner could not spend his scrip anywhere else except at the coal company store that was owned by the coal company he worked for. The products sold at the coal company store were often over inflated. Tennessee Ernie Ford touches on this in the song “Sixteen Tons” where he asks St. Pete not to call because he owes his soul to the company store. If that wasn’t bad enough, the coal operators who paid the miners by the ton of coal mined rather than by the hours worked in the coal mine also implemented a devious greedy practice called “cribbing”. Cribbing was adjusting the scales that weighed the coal mined by coal miners in order to cheat the miners. The scales were rigged in such a way that the miners would have to load anywhere from 2,200 to 3,500 pounds of coal to get credit for loading one ton (2,000 pounds) of coal. How about mentioning the “Bull Moose Special” train that ran up Paint Creek and shot up the town of Holly Grove 1913? What is so amazing about this story is, not only Quinn Morton, the coal operator, was on this train but also the sheriff of Kanawha County, Bonner Hill. According to congressional record, while relatives and friends were trying to bury the dead inflected by the Bull Moose Special within one-half hour between 800 and 1,000 rounds were shot into the town of Holly Grove from the Baldwin-Felts detectives who were positioned on the hillsides around Holly Grove. While the good old boys from the Baldwin-Felt Detective Agency has been mentioned let’s tell some of the things they did. For example: beating a woman into a miscarriage at Holly Grove or cutting off a woman’s breasts at Kayford on Cabin Creek. How about the one-sided military trails that took place at Pratt, WV where the coal miners had no civil or constitutional rights; where fifty coal miners were tried at once for murder Another miner was sentenced for seven years in the penitentiary just for swearing at a militia officer. This particular miner was arrested on Tuesday, tried on Wednesday and was in the West Virginia State Penitentiary on Thursday of the same week. These court proceedings were sometimes called “kangaroo courts“, arrested yesterday, tried today, and sent to the state penitentiary tomorrow. Ironically, not one of the Baldwin Felt detectives ever went to trial for the crimes they committed during the strike. Let’s be perfectly clear here, it was not peaches and cream for coal miners during that era. They fought for everything and lived a life of misery. Those were the glory days for the coal operators. If the W.Va. Culture and History Center wishes to whitewash history then it’s not history. Sadly, the Gazette fell victim to the glitz of $17,000,000 and came out with an early editorial praising the museum rather than checking the facts. If we had a paper willing to look closely, perhaps my efforts and this latest letter from our Union would not have been necessary . We need and expect our media to expose falsehoods when they are perpetrated. Perhaps the best window into the lack of committment to accuracy at the museum can be obtained by quoting from Stan Bumgardner, Director of the State Museum, in a letter of March 9, 2010: “The historians essentially were not paid for their work, so it didn’t make a lot of sense to keep revising the text and asking them to review the material for a second time(for free).” A $17,000,000 museum and the historians were not paid!!! While I appreciate Kovarik’s contratulations to our state’s professional historians, I know of no others who had the nerve to object. Our state’s professional historians tend to work at institutions that are funded by Big Coal and silence is golden in terms of tenure…. Seems to me that this particular battle is one that should not be left undone. In other words, just firing off a letter may not be enough. This needs to be corrected, and if it is not, then there needs to be some sort of civil disobedience or at the very least continual picketing until it is corrected. History is important. If this isn’t corrected, then perhaps the Union could set up a historical society of their own, next door…..
I’m thrilled to see that the UMWA has submitted an official statement about issues with the WV State Museum’s coal exhibit, although Wess Harris has devoted the past year or so to pointing out inaccuracies and omissions. As an Appalachian Studies educator, I hope the museum officials address these issues so the youth of our region are able to learn the full picture of their history. I greatly appreciate all of the attention from some wonderful Appalachian scholars … but please be sure to read No. 5 on the Coal Tattoo comments policy, http://blogs.wvgazette.com/coaltattoo/comment-policy/ and keep the cheer-leading to a minimum. Actually the museum factually represents the reality of coal mining in the past 100 years as the state and coal companies continue to white wash the facts. Now as then the UMWA must make clear to the public the truth. This is exactly why unions are still so important. The landscape of the workplace hasnt changed, just the owners representation of that landscape in a more educated diatribe. Mining, of which my father and grandfather both were part of, was, is and always will be, a profession in need of a union. I an IBEW member salute the UMWA for their work. Mountaintop removal mining and the destruction to our glorious mountains from this very destructive practice. For way to many years now, I have heard how the existence of unions is the reason for so much of America’s woes. They talk about the high wages that arre made by union members and a benefit package that causes others to want equal benefits. Well, it was people like John L. Lewis and the members of the UMWA that many years ago fought to gain these benefits and wages. If it had not been for nion leaders like Mr Roberts today with his staff of bargainers, this country would still be in the dark ages. Could you imagine working in a mine without union representation? The number of blacklung cases would be doubled and without compensation for that terrible disease. I worked for 20 years in the mines owned by Jim Walter Resources in Alabama. I was injured in a mining accident to left me with a broken back and years of chronic pain. This happened in spite of all the training we received on safe practices while lifting and carrying heavy objects. It was not caused by disobeying the work safety practices, but just an unfortunate accident, but could you imagine if there were no way to protect ouselves foremans that could care less if someone was injured as long as his quota was met.